Dropouts from a college don't spring to mind as obvious prospects for major gifts. For one thing, it's not even clear how well universities track these folks and keep their contact information up-to-date. For another, the simple fact that they dropped out suggests they were none too pleased with campus life. But if you think cultivating dropouts is a waste of time, think again. Harvard University has received millions in gifts from Bill Gates. 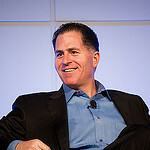 Or take the example of Michael Dell's relationship with UT Austin. Dell famously dropped out of UT after he started assembling PC computers in his dorm room in the 1980s. But he clearly loves the place. More than six years ago, we announced a series of grants to the University of Texas to support children’s healthcare, with a particular focus on combatting childhood obesity. Since that time, our original commitment has grown to include the Dell Children’s Medical Center, UT Austin’s Michael & Susan Dell Center for Healthy Living and Dell Pediatric Research Institute, the Texas Center for the Treatment and Prevention of Childhood Obesity, as well as clinics and other community-based health efforts. That earlier round of gifts amounted to least $50 million, so the Dells' total healthcare-related gifts to UT now total over $100 million (Read Dell executive director Janet Mountain's IP profile). And Dell money is not just flowing to UT for healthcare. The Dells also recently put $10 million for a new computer science center on campus, in concert with a bigger gift from Bill and Melinda Gates. The Center will bear the names of both couples — which is fitting, since they all got crazily rich by helping each other: Gates made the software that made PCs so useful. Dell made the PCs themselves, licensing untold Microsoft's products. Oh, and one last thing: It's not Michael and Susan Dell who are shoveling money to UT. It's also Dell, Inc., which has its own philanthropic arm. The company has given $22 million to the university in recent years. "In 2011 alone," reports the school, "Dell, Inc., gave $14.8 million in funds, goods, and services to many areas of the university, including UT Elementary School, the Texas Advanced Computing Center, the LBJ School of Public Affairs, and the McCombs School of Business." The company also works closely with UT's business school. Michael Dell's involvement with UT Austin is quite unique in some ways. Austin is a pretty small city, and Dell, Inc., is a huge player there. Dell himself was born in Houston, but he never left funky Austin for greener billionaire pastures after making it big. So it makes sense that both Dell and his company would team up with the university to try to improve Austin. So maybe the moral of the story here is that universities should look for rich dropouts that are still hanging around town.